Tharsis is an interesting title that arrived earlier this month and came under flak by a lot of consumers for its difficulty. The game combines rogue-likes, gambling and board game design into one of the hardest and intriguing titles I’ve seen in awhile. The story of the game is that you are part of a six man expedition to Mars with only ten weeks away from the planet when disaster strikes. After a meteor storm, the ship is left damaged and two crew members are dead; leaving the remaining crew to keep the ship intact on a now one-way trip to Mars. Every week, you will order your crew member around the remaining parts of your ship; either fixing events before they cause trouble or working stations to provide important resources. Each station on the ship has a special ability that a crew member can use and each crew member has a special power as well which plays into strategy. After you’ve finished assigning everyone, any failed events will take place and cause damage to your ship, crew or to functions on board. If the ship runs out of life or all your crew members die, it’s game over. 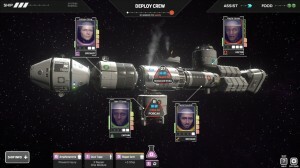 You may have noticed that I haven’t talked about the gameplay yet, and that’s because Tharsis is very unique in this regard. 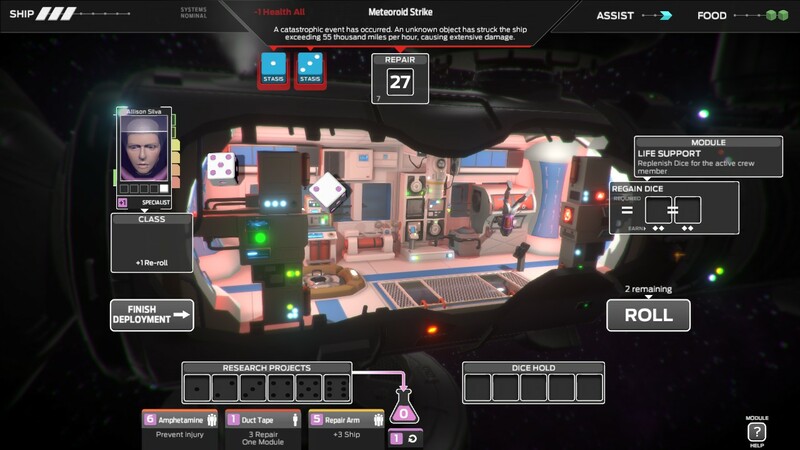 Tharsis’s gameplay combines the fine line between success and failure of a rogue-like, with the randomness of a board game. Each week, the game will assign random events to the stations of your ship; the event type, consequence and results needed also being randomized. You’ll have to decide which of your four crew members to send to the event; taking into account their health, stress and number of dice available. At the event, each crew member by default gets two rolls (the specialist get three) of all their available dice. Some events can punish the player if they roll specific values; causing dice to freeze, disappear or hurt the crew member. After a roll, you can do the following with your dice: Contribute to the event, hold them for the next roll, apply them to the crew member’s special ability, use them with the station’s specific ability, or apply them to research. If you can’t complete the event with one crew member, you can keep sending crew to try and win the event. After all four crew member have completed their action, time will move forward one week and all the events that you did not fix will take effect. Besides your crew members’ health, your ship has a health stat that will go down from negative events; running out of ship health is an instant game over. The final action for a week is to decide between actions your crew members’ will do and dividing up the food which will restore dice. You’ll have to do this for each week, with growing numbers and degrees of events threatening to doom your ship. With all that said, there are advanced mechanics with knowing how to use the different ship functions, assists and the as mentioned research. For one final piece of desperation, you also have the option to eat the remaining dead crew member or any crew that are close to dying; this will restore dice, but lower your max health. 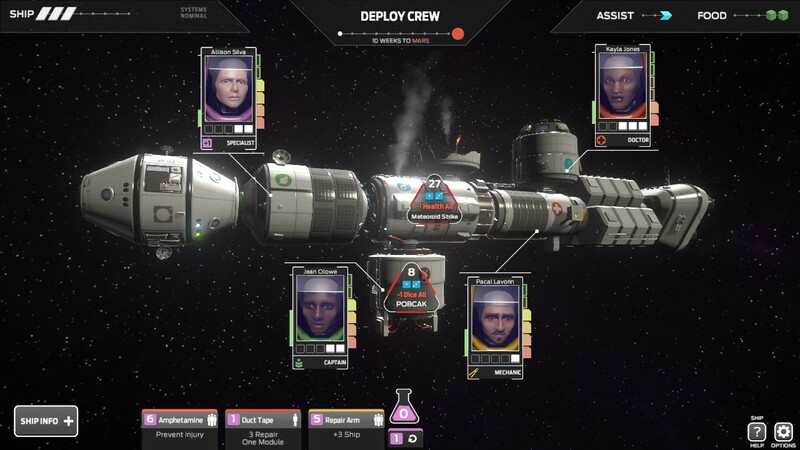 While a single play of Tharsis won’t take you long, there are a lot of choices that you will have to weigh the risks and rewards on in order to stand a chance. 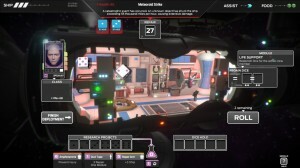 Abstracting all the actions to create this board game-type design was an interesting move by the developers, and it gives Tharsis a unique feel compare to other games. With that said, it’s time to talk about the biggest complaint levied at the game and how difficulty is factored in. Tharsis’s difficulty stems not from the player learning the mechanics, but the luck based on their dice rolls. Because all of your actions are tied to what values you roll, it’s very easy for a good run to go sour or to get cut at the knees right from the get-go. 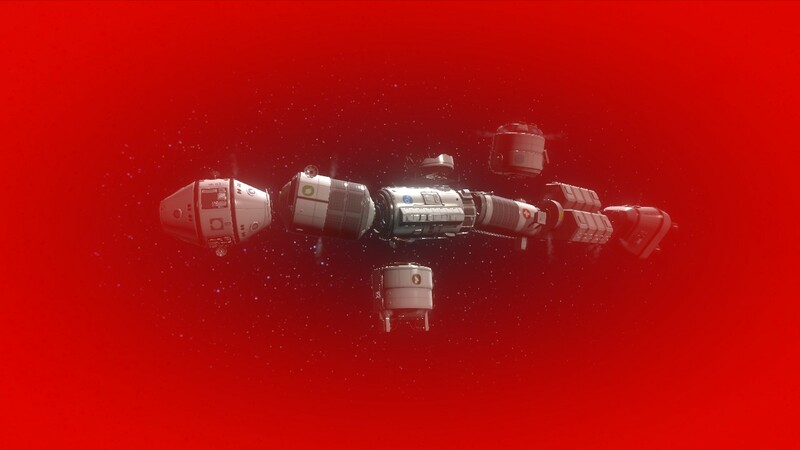 Beating a game of Tharsis requires you to maintain momentum in terms of events and resources each week; start to fall behind and the negative feedback loop will make it very hard to win. You can argue that there is skill involved with knowing when to activate stations, research and crew powers, but those actions are still tied to the luck of rolling the correct values. Since everything is randomized, expect to have wildly different experiences, and yes, it’s possible to get completely screwed on the very first turn. 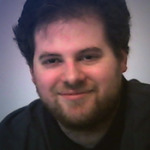 There are no guarantee ways to control the roll of the dice; the game uses a physics-based system to simulate rolling real dice on a board; meaning that the number of ways that a player can actually influence the game is very limited. Going back to my piece on luck and probability, Tharsis is a game that is definitely on the side of luck being the determining factor, and that can be very frustrating to play. This also presents an interesting debate as this was not a case of the developers not understanding their design, but explicitly designing the game this way from the ground up. Tharsis is going to be a very polarizing experience and your overall impressions are going to come down to the luck of the draw. While I can appreciate the game, the more I play of Tharsis, the less interested I am in having my entire play through come down to the roll of the dice. I’m already unlucky enough at gambling as is; an entire game is just not for me. For more on Tharsis, you can watch my attempt at it on the YouTube channel.